Valve, developer of the blockbuster series Half-Life and Counter-StrikeTM, unveiled Team Fortress 2 to be included in its next release, Half-Life 2: Episode Two. In addition, the studio announced its plans to deliver it for the PC, Xbox 360 and PlayStation 3. Team Fortress 2, an all-new version of the title that spawned team based multiplayer action games, features the most advanced graphics of any Source-based game released to date. 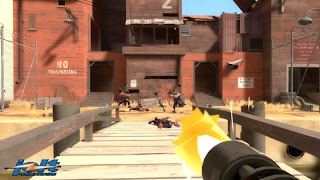 Players choose from a range of unique character classes such as medic, spy, sniper, or engineer and must work together to complete a variety of tactical objectives. Team Fortress 2 and Portal will be included with all retail and Steam versions of Episode Two for the PC. In addition, these products plus Half-Life 2 and Episode One will be available in one tremendous offering for the PC, Xbox 360 and PlayStation 3. New videos from Episode Two, Portal, and Team Fortress 2 will be released next week. Just like its predecessor, Team Fortress 2 players will be able to choose to play as one of several archetypal classes at the start of a match, each with its own unique strengths and weaknesses. 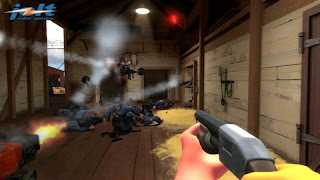 While it is unknown if the abilities of each class will be similar to the original Team Fortress, all indications so far are that the basic elements will remain the same: Heavy Weapons characters will have huge guns with incredible firepower but will have a slow walking speed, scouts will be able to move very quickly, but are lightly armoured, and so on. While it is unclear at this time what sort of game types will be included upon release, capture the flag and control point matches are likely to return. Team Fortress 2 will not opt for the realistic graphical approaches taken by the official Valve games Day of Defeat and Counter-Strike. Rather, it will use a more stylized, cartoon-like approach. The effect seems to have been achieved using a special Valve in-house rendering and lighting technique making extensive use of Phong shading . The game will debut the Source engine's new dynamic lighting, shadowing and soft particle technologies, among many other unannounced features, alongside Half-Life 2: Episode Two. It should be noted however, that the depth of field and motion blur effects seen in the game's trailers cannot feasibly be rendered during gameplay unless inferior approximations, such as vector motion blur or image -space depth of field, were to be used. A collage of the Team Fortress 2 player classes in action. 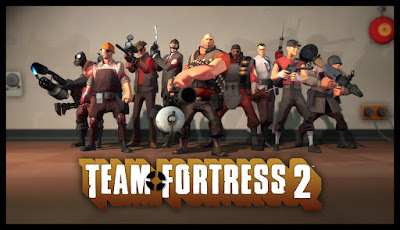 Top row: (left to right) Demoman, Engineer, Heavy; Middle row: (left to right) Medic, Pyro, Scout; Bottom row: (left to right) Sniper, Soldier, Spy. Is that what that is??!! I've been trying to get this beast Half-Life Counter Strike off of my computer for ages now!!! I'm glad my middle child didn't catch on or he'd be glued to the computer for hours!! !